Almost two decades ago now, in the early 1990s, my wife and I lived for a year in Hikone, a medium-sized city in central Japan, about an hour’s train ride north of Kyoto. 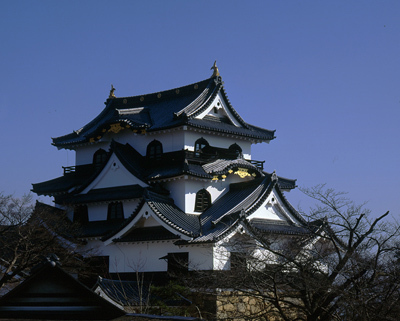 The city’s most visible claim to fame is Hikone Castle, a 380-year-old wooden fortress that dominates the downtown skyline. But the most enduring memory I took from Japan and have never forgotten is the profound impression of its many Shinto shrines — roughly 80,000 of them, according to various sources — that dot the landscape and invite the casual visitor as well as the reverent worshiper. I usually found myself somewhere between the two. But this wasn’t ever a problem. Visitors, including foreigners, are welcome. Shinto shrines are impressive for their openness. Many (especially the smaller and rural ones) are free to visit (though of course donations are gratefully accepted), wonderfully peaceful, and lovingly tended. Not once did I see any graffiti or vandalism in the dozen or so shrines I frequented, in either countryside or city. Often enough I was the only person present, which allowed for a meditative experience of the grounds and atmosphere. Here’s a shot of the entrance to Taga Taisha, about 20 minutes from our apartment in Hikone. During matsuri or festivals, however, a shrine can be absolutely mobbed, and that’s a wholly different experience, also not to be missed! 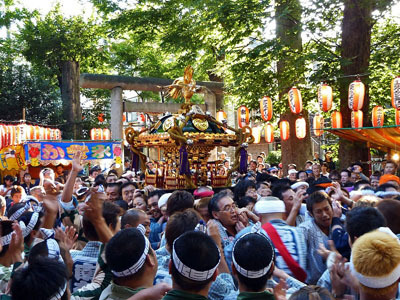 You can catch something of the energy of a festival in this shot below of Tenso Jinja shrine. The celebrants in the background carry a mikoshi, a portable shrine, back to Tenso Jinja after a day of parading it around the town. Usually there’s a musical accompaniment, and the bearers of the mikoshi can get very enthusiastic in their chants, drawing quite a crowd. In retrospect, the experience felt very Druidic — all that energy, all the communal good feeling, everyone included. 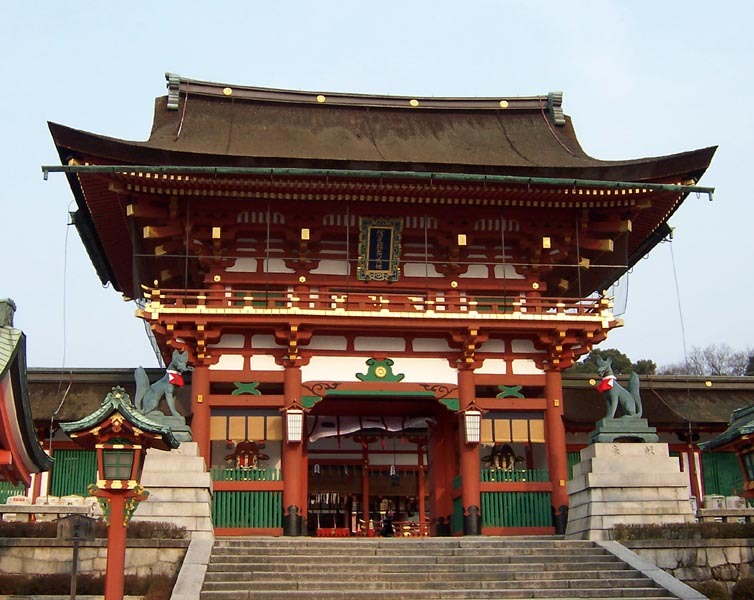 Shinto is the “way of the kami,” the Japanese word used to translate both English “god” (and “God”) as well as “spirit,” “ancestor” or “essence.” From the Shinto perspective, the world of the kami overlaps with ours. Everything has its kami, and the natural world is full of places that manifest the particularly strong presence of kami. Thus, natural objects pervaded with kami often receive a small marker shrine and sometimes other identifying signs, like at Hatagoiwa just off the coast in Ishikawa prefecture. 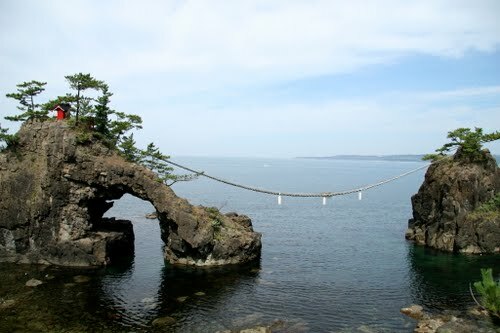 Note the rope linking the large ocean rocks, as well as the small red shrine atop the larger rock. 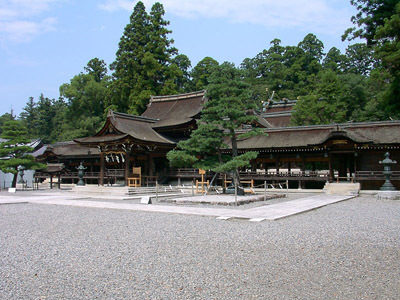 Shinto focuses on practice more than belief. One of its key practices is purification, so that we can participate in the world of the kami more consciously and harmoniously. 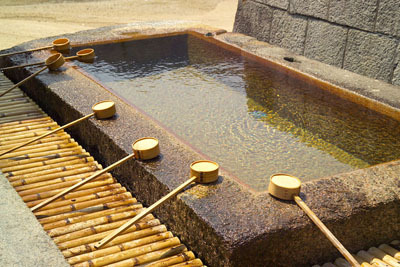 For that reason, the entrance to a Shinto shrine typically includes a temizuya (literally “hand-water-spot”) or basin for ritual washing before proceeding further. Here you can see the basin and the bamboo dippers for washing. 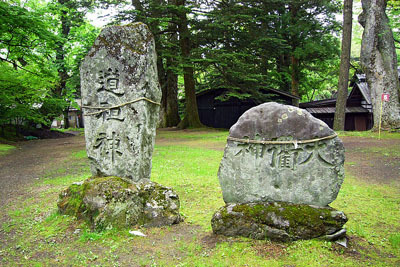 The marker signalling the sacred space of a shrine is the torii gate, through which all visitors pass. 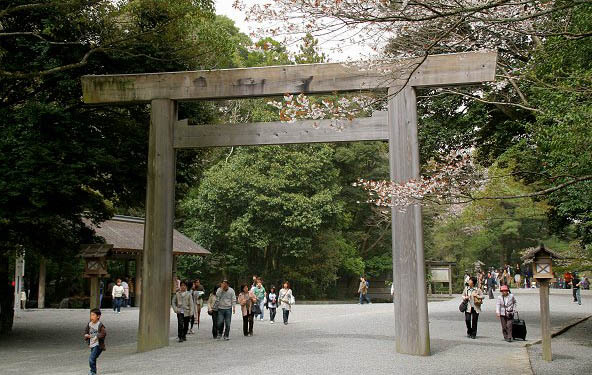 The torii may be simple, like this wooden one at Ise, one of the oldest and most famous shrines. 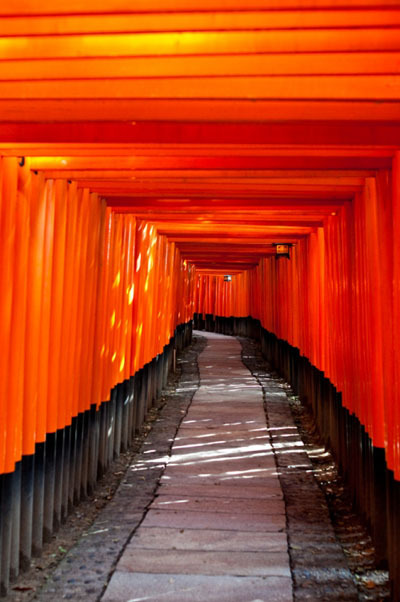 Or it can be wonderfully elaborate, like the main entrance of Fushimi-Inari Jinja near Kyoto, and inside, its sloping corridor of seemingly endless red torii. Lest you feel this is all well and good, but for all that still remote from your life, there’s a major Shinto shrine in Washington state, near Seattle, named Tsubaki Grand Shrine. And among its kami is Kokudo Kunitama-no-Kami, who protects the North American continent. Here’s a shot of the interior of a shrine, featuring dosojin, or kami representing an ancestral married couple. 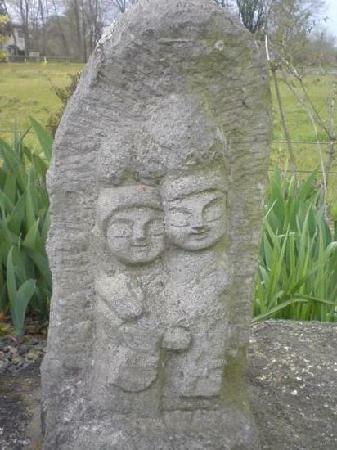 Dosojin are protective spirits, and often placed along borders and boundaries. The last shot is of a dosojin more recognizably human, marking a field border. Images: Hikone-jo; Taga Taisha; Tenso; Hatagoiwa; Ise torii; Fushimi-Inari; Tsubaki; dosojin; dosojin2. It may be a long while before I can go to Japan. Would you know of any books or websites on Japanese Shinto traditions to recommend to North Americans wishing to learn more? Hi Runningwave, thanks for your comments! This BBC site is good — too bad it’s being archived, but it’s still available: http://www.bbc.co.uk/religion/religions/shinto/. There’s also a Youtube video series, narrated by Ben Kingsley — the second episode here is particularly rich with visuals: http://www.youtube.com/watch?v=4ET91wXsDNk&list=PL94A54EBD87F88B36.